I've always had a really good skincare routine, even when I was young, my mum always used to mix me up a rosewater and witch hazel cleanser which I would use after I'd taken my makeup off to soothe and smooth the skin. Clearasil, seemingly the only other cleansing product on the market in the mid 90s was way too harsh, so I was grateful to have a gentler alternative. Throughout my teenage years I wore some terrible makeup, as no doubt most people did(!) but one thing I made sure of was that I'd always take it off at the end of the day. Even now, the thought of going to bed in my makeup makes me shudder and no matter how tired I am (or how many drinks I've had!) I always take my makeup off and properly wash my face before my face hits the pillow. Key to my makeup-off routine is cleansing. I take my makeup off with a cotton pad and micellar water usually, but this is never sufficient; I like to properly cleanse with another product to ensure my skin is clean before I apply eye serums or night cream. 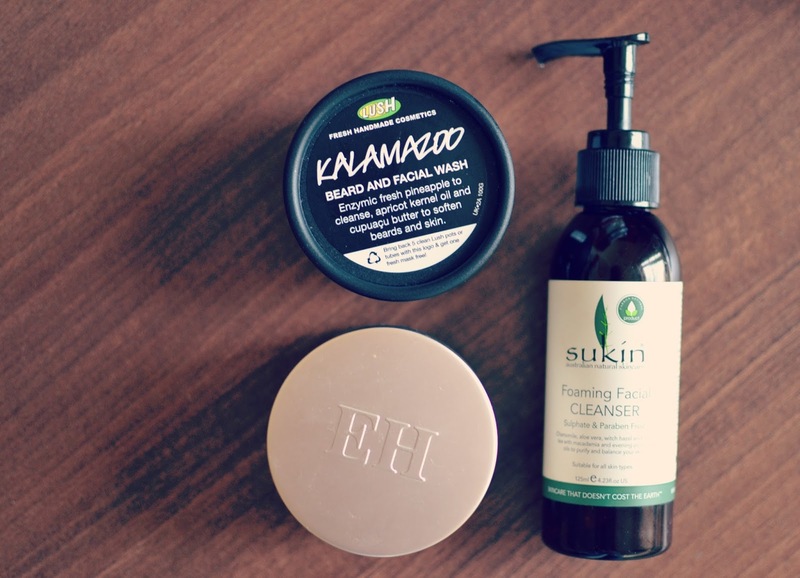 Over the years I've tried a few different cleansers, but there have been several favourites which I have always reverted back to. Emma Hardie Amazing Face Moringa cleansing balm is an amazing product which actually negates the need to use a makeup remover. It's an oil based cleanser, so it removes makeup easily whilst softening and moisturising the skin. It can then be removed with a warm flannel or muslin cloth, and your face is clean and ready for moisturiser. This is the most expensive of all the cleansers I've used but this pot lasts for absolutely ages, so it's worth the outlay. A more recent cleanser favourite comes from Sukin, and I've posted a more detail review on that here. I love to use this foaming cleanser on a konjac sponge (I've talked about those here too!) and it leaves my face leaving super clean. I have found that if I overuse it, it can make my face feel a little bit tight, so I try to use this just a couple of times a week. I also use it in the morning, to wash my face before I apply my makeup. More unusually, this Kalamazoo beard wash by Lush was something I initially bought for Adrian to use. One day I realised I'd run out of cleanser so I tried a little of this - and I loved it! Super softening and with a delicious, fresh, citrusy scent, it's a really gentle cleansing face wash. At £6.95 it's actually the cheapest cleanser I've tried and I've actually bought my own pot! The sales assistant I spoke to in Lush said that she uses it frequently too, so having a beard isn't obligatory to use it!